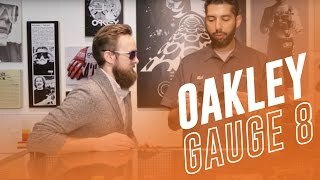 Oakley Gauge 8 L sunglasses take a leap forward in innovation and design for everyday eyewear and not just sports. Oakley’s Gauge 8 L model sunglasses feature a C-5 alloy design with monoshock hinges to provide more flexibility and comfort. These Oakley sunglasses offer two different frame sizes for users with medium & larger faces, and Oakley’s Three Point Fit System provides ideal eye alignment. Oakley Gauge 8 L sunglasses are built with Unobtanium earsock grip design to help the glasses stay in place when you start to sweat on your face. If you need a pair of Oakley prescription sunglasses, you can't go wrong with a pair of Oakley Gauge 8 L prescription sunglasses.